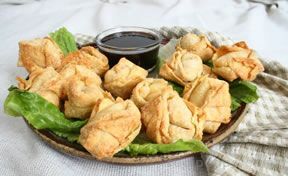 An Asian appetizer that is baked instead of fried. The edges get crispy while the creamy filling is hot and creamy. You're going to love these homemade take-out treats. Preheat oven to 350 degrees F. Spray mini muffin cups with cooking spray. 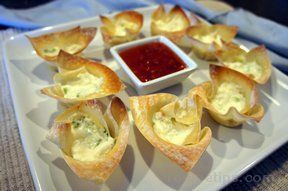 Mix crab meat, cream cheese, onions and mayo. 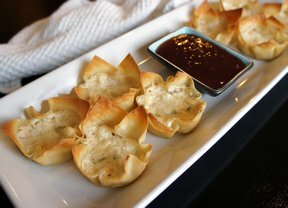 Gently place 1 wonton wrapper in each muffin cup, allowing edges of wrapper to extend above sides of cups. 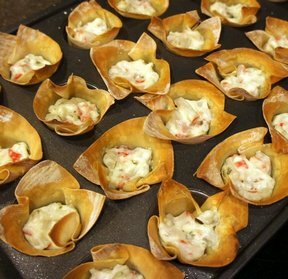 Fill evenly with crabmeat mixture. Bake 15-18 minutes or until edges are golden brown and filling is heated through. "I made these for the football games on New Year's day. I like them, but my wife wasn't a huge fan. Great with sweet chili sauce."